...You're dedicated and you've got grit. That's how I learned what I know about effective presenting. And I'm here to tell you that if I could go back and do it all over again, I wouldn't. If I could go back, I would choose to save myself 10 years of hassle, mistakes, and countless failures. I would have opted to take the shortcut. I would have opted out of an approach that was one step forward, two steps back most of the time. I would have opted in for a starting point that was effective, so that after 10 years of work my presentations would blow people away. I'm 14 years wiser now, and I'm writing this post to help you avoid making the same mistakes I made. I could have avoided all of that wasted time if I had just taken some training. So, here are the key reasons why you should take formal training instead of trying to be a self-taught effective presenter. 1. PowerPoint skills =/= effective presenting skills. You WILL NOT become an effective presenter by just becoming better at using PowerPoint (or whatever app you use). I've seen presentations on YouTube by people who have advanced skills and can do amazing things with the app. But, if they actually used those slides to teach students or share the findings of a project...it'd be overwhelming and ineffective. Without training and guidance, you're almost guaranteed to waste your time teaching yourself things in PowerPoint that people like me recommend you avoid under all circumstances. In fact, you probably have at least 80% (or more) of the PowerPoint skills you need to be an effective presenter. 2. Baby steps don't work the way you think (in this context). You WILL NOT present more effectively just by creating more presentations. There are a lot of things where practice makes perfect. Where, if you just do the thing a lot, you'll get better. That's how cycling was for me. Each time I rode my bike, I could go a little farther or a little faster than last time. I'm sure you have things in your life where that's the case, too. But it doesn't work that way for learning how to be an effective, engaging communicator. 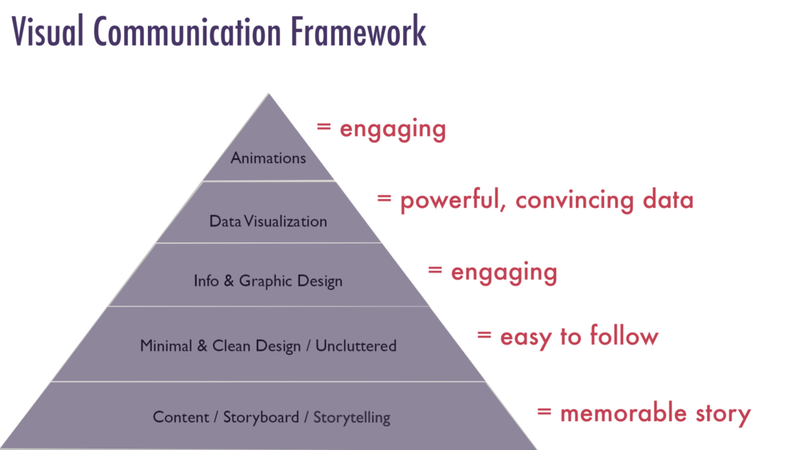 If you want to design and deliver an effective presentation, you must apply multiple layers of this framework all in a given presentation. An effective presentation begins with a quality storyboard, applies modern and decluttered design, then applies good graphic/information design. When it's applicable, data is shown using effective principles and animations are used to reduce -- not cause -- confusion and overwhelm. If you aren't applying all of that at once, your "baby step" just means you're still presenting ineffectively. When it comes to effective presentations, it's actually better to take one giant BIG step at first (to apply the minimum effort of each layer), and THEN take baby steps afterwards. Training is what gets you through the BIG step, quickly. From there, you can take as many baby steps as you want. I recommend you read the blog post I wrote about this, because I show you how I took "baby steps" (i.e., only applying a few layers at a time instead of the whole framework), and that ultimately meant I created ineffective presentations for 9 years. Then, all of a sudden, I had a "lightbulb" moment and started applying the entire framework, and my presentations improved almost overnight. That was my BIG step, and it happened quickly. Since then, I've improved my presentations in baby steps while still presenting effectively. 3. Training yourself will waste a ton of your time and money. You WILL NOT save time and money by training yourself on effective presenting. How valuable is your energy? If you said "valuable" to either of them, then it doesn't make sense to waste your time and energy...right? That's exactly what you're doing if you're trying to learn how to be an effective presenter on your own. Imagine if you wanted to teach yourself how to conduct statistical analyses rather than take formal training. You'd probably search Amazon for books. With just one search term. "statistics 101" there are 147 results to sift through! If you took 10 minutes to review them all, that'd be almost 25 hours of your time just to make a decision. Who has the time to sort through that? I mean, honestly. We both know what will happen...you'll only look at the first page, maybe the first couple of pages. But thanks to the Google algorithm you have ZERO guarantee it's up-to-date information and ZERO guarantee it's correct. In fact, if it's first on the Google search page, there's a chance it's old information because it's had more time to have more views. So by now you might be thinking that you don't have the time to read all this stuff, so then you go to YouTube and try there. Which, is fine. There are things to watch ... but again, you have no idea what type of quality you're going to see. ...And...uh....what order are you supposed to go in? I mean, can you imagine trying to teach yourself stats or research design this way? Wouldn't it be faster, easier, and cheaper to have someone else just tell you which books are the best ones to read? Ahhh. Exactly! There's one major reason it saves time and money to take training: the instructor already sorted through this mess and only shows you the helpful, useful, good resources. So now that you get what I'm saying in regards to learning stats, let's bring that back to effective presenting. Let's go back to Amazon and type in "effective presentations." There are over 1,000 search results! At 10 minutes per result...eh I'm not gonna bother because we both know you'd never actually take the time to do that lol! And most of the books are focused on one piece of the entire presentation, or just focused on PPT skills. So you'd easily spend hundreds of dollars on books if you wanted to learn the entire framework that I mentioned above. And guess what! The top hits tell you one of the biggest lies ever about how to create compelling presentations. The 10-20-30 rule is a bad idea. Gah! Again, let's be honest: you're only going to have time to look at the top hits in Google, which does not translate into quality or accuracy. You're only seeing posts that a lot of people have looked at. If you rely on Google, then you're going to spend sooooo much time sorting through the garbage, and you wont know what's myth vs effective. Even if you purchase a great book. ...You still have to figure out how to translate that written, static material into a dynamic, slide presentation. This is not an attack on books about effective presentations! This is part of how I tried to learn, and it was helpful. I'm only acknowledging a limitation of that type of media for this specific topic--no matter how helpful the book is. Imagine if you read a textbook on how to be a engaging, effective instructor...but you couldn't watch an instructor teach effectively. Wouldn't it be helpful to see an engaging instructor in action? Slide presentations are one of those things where it's really helpful to learn the strategies while seeing them in action. That's not something you can get from books, blogs, or even YouTube videos like the ones I make. Those formats don't show you what to do: they tell you what to do. 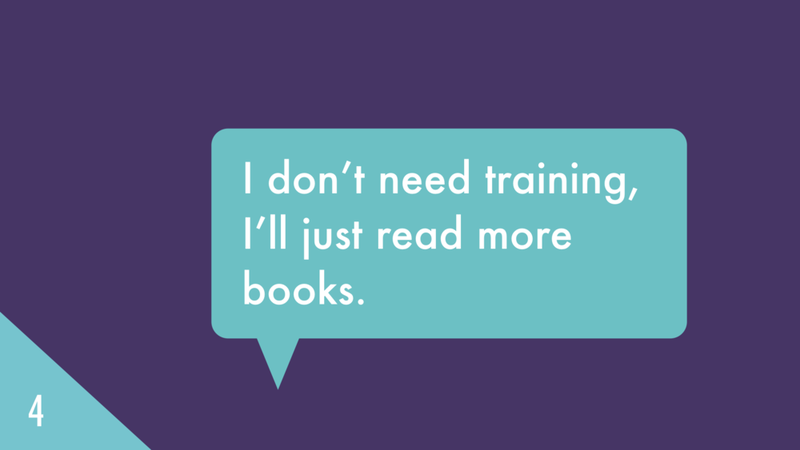 Wouldn't it be great to have training that does both at the same time? That's why video training, like my Blast Off to Stellar Slides is so helpful, because I'm telling you exactly what to do while showing you what I mean. Maybe you're wondering whether YouTube can help with this. Spoiler: No, not even close. I've watched a lot of videos and they're great as a visual blog post, or for technical training, but you will not learn the foundational skills you need to become an effective presenter with YouTube videos. 4. There's no guarantee you'll learn what you need to learn if you teach yourself. You can take all the baby steps you want, learn advanced PowerPoint skills, and take 10 years to train yourself...and you still might present ineffectively. YIKES. That's some hard truth right there, friend, I know. How are you supposed to search for a blog post, YouTube video, or book for something that you don't even know is important? What search terms do you use for things that you don't even know exist? How do you find tech trainings for features in PowerPoint that you didn't even know were there? To me, this is the #1 reason you should take training because then you know you will present effectively if you follow the strategies you're trained on. Training gives you the confidence that you're actually presenting effectively. So there you have it: the top 4 reasons you should take formal training on effective presentation skills, instead of trying to do it on your own. Not only will you save yourself a ton of time and money, but you'll improve significantly faster and -- ultimately -- have the confidence that you are, indeed, presenting effectively. Convinced? Then don't waste another second! Sign up for my FREE training right now, using the form below.